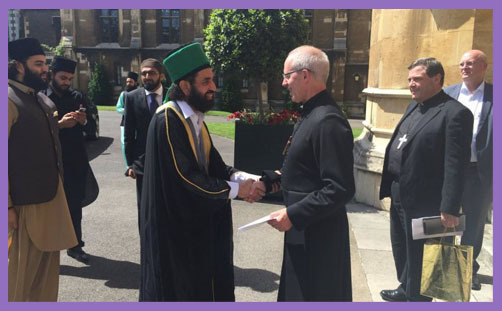 Why is it "great to welcome" Muslim hate-preachers to Lambeth Palace? “Great to welcome Herod Antipas to the Cenacle on Mount Zion today,” tweeted Jesus, just after the Tetrarch of Galilee has ordered the decapitation of the notorious hate-preacher John the Baptist, whose head was then served up on a silver platter. You can’t go around Perea baptising unauthorised prophets willy-nilly and denouncing the governor’s marriage as incestuous and contrary to Jewish law, so Antipas was urged to deal swiftly with the problem. It was a religious duty. …a man with inborn graciousness and a compassionate nature who exudes a special, spiritual charisma. His respectful eminence is a paragon of virtue that walks in humility and with utmost humbleness. Whenever an individual meets with him on the veranda of Eidgah Shareef, whether it is the US Ambassador or an illiterate laborer, warmth and love radiates naturally from his smiles and greetings, engulfing the guests in its embrace. He is like a river of generosity and kindness that compels people from all walks of life to come and share their problems with him. They seek his blessed wisdom, regardless of the nature of their individual problems, whether worldly or spiritual. The Muslim clerics have led a high-profile campaign in Pakistan in praise of assassin Mumtaz Qadri, who was executed in January after murdering liberal Pakistani politician Salmaan Taseer in 2011. The Punjab governor had criticised Pakistan’s strict anti-blasphemy laws, and Qadri claimed it was his religious duty to kill him. Of course, the Archbishop of Canterbury has to shake hands with all sorts of unsavoury characters – Robert Mugabe, for example. But one can’t quite see him tweeting: “Great to welcome President Mugabe at Lambeth Palace today.” It wouldn’t strike quite the right tone, would it? So why is it “great to welcome” Muslim clerics who hail Islamist assassins as holy warriors? Haseeb ur Rehman declared: “..every single person who loves Islam and Prophet (Mohammed) is in grief for the martyrdom of Mumtaz Qadri because he has been hanged last night.” Is it really “great to welcome” those who incite murder? Is it “great to welcome” those who conflate murder with martyrdom? Is it “great to welcome” those who propagate an ideological cult which demands absolute submission to a vision of Islam in which blasphemy and apostasy are punishable by death, and the duty of all followers is Jihad – the struggle against all that corrupts the world of Allah and all that offends the precepts of Mohammed? Why are these clerics even allowed into the UK to preach in British mosques? What, exactly, was Shaykh Muhammad Naqib ur Rehman here to preach? 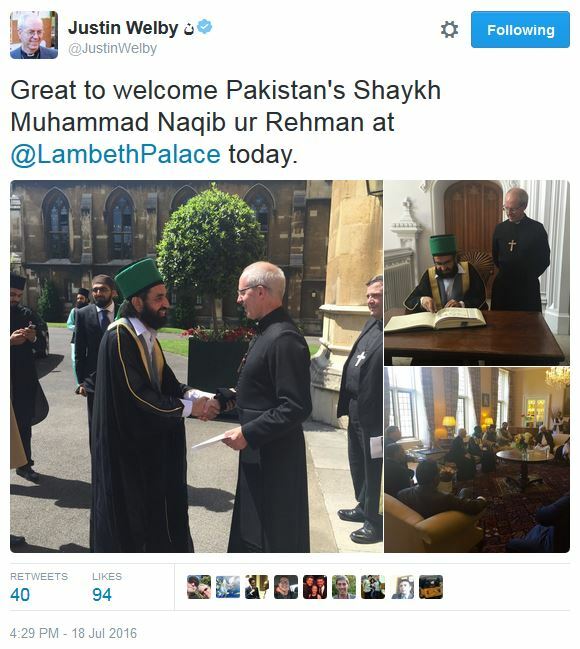 Maybe “warmth and love radiates naturally from his smiles and greetings” at Lambeth Palace, but one wonders how many potential suicide bombers in Bradford, Luton and Tower Hamlets are inspired to become “holy warriors” if they hear that Mumtaz Qadri is a role-model martyr; a beautiful pattern of conduct for any one whose hope is in Allah and the Final Day. It is one thing to come to the UK and tell the BBC and Channel 4 News that you bring a message of “peace, love and tolerance, which the essence of Islam is”. But surely that essence must be consistently expounded in Pakistan, too? How can we eradicate Islamic extremism from our shores if the Government grants visas to jihadist prophets and Lambeth Palace rolls out the red carpet and tweets how great it is to welcome them? How can we condemn Pakistan’s blasphemy laws and then laud those who glorify the murder of the man who tried to reform those laws? How can we condemn the appalling persecution and incarceration of Christians like Asia Bibi, sentenced to death by a court under those laws, and then say how great it is to welcome those who oppose justice, mercy and religious liberty? The Archbishop of Canterbury uses such meetings as an opportunity to understand, glean information and make intercession on behalf of Christians like Asia Bibi. You may be sceptical that he would so, but Justin Welby is no fool. It is important to forge diplomatic relationships with other religious leaders who can provide insights into what is going on in a particular country or region. Pakistan is one of the Archbishop’s priority countries, and the Shaykh is a leading Sufi leader. But “great to welcome” such people it most certainly is not. Such ovations ought to be reserved for worthy dignitaries, or for real victims like Shahbaz and Shehryar Taseer, or Asia Bibi herself, should she ever be freed. Perhaps Lambeth Palace might extend its Twitter house style to incorporate a different kind of salutation for those whose salaam isn’t quite as peaceful, gracious and compassionate as their spiritual charisma radiates.